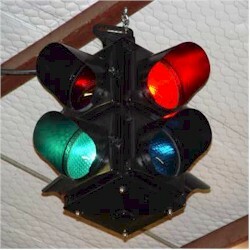 I remember one of these at the intersection of Park Lane South and Forest Parkway in Wiodhaven, Queens. sunce there was no yellow, it would go from green, to red and green at the same time, then to red. It made a very distinct clicking sound every time the light changed too. Of course. I think they took down the last one around here when right turn on red started in 1975. The last place I recall seeing these was along Jerome Avenue in the Bronx. That was maybe 1970.